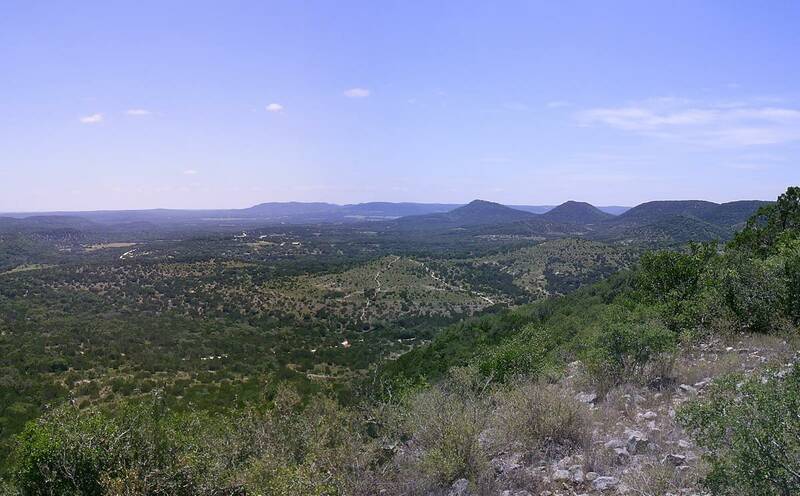 You’re running the Bandera 100k down in south Texas. It’s a gorgeous January day with blue skies and temperatures in the upper 50s Fahrenheit. Truth be told, you’d prefer if it was a bit cooler. Your t-shirt and sports bra are damp with sweat by the time you finish the first 50k loop. You grab a headlamp and a windbreaker and head out into the night, hopeful for a PR. Unfortunately, in another two miles, your stomach turns and you vomit. Then you vomit again. You’re reduced to hiking. The wind blows harder and the temperature drops. “Dang! It’s cold!” You wish you’d picked up your long-sleeved shirt as well as your hat and gloves. It’s another three miles to the next aid station. What’s the best thing you can do right now to prevent getting colder? A. Get out of your wet shirt and put on your windbreaker. Try to answer before continuing. Well, sure. The faster you move, the more heat you’ll generate, and the warmer you’ll feel. If you weren’t nauseated and calorie-depleted, this would be the easiest thing to do. Hike fast, pump your arms back and forth, and throw in some arm circles to force warm blood down to your cold fingers. Unfortunately, you feel too wrecked to do much more than plod. Yes, do that! You need calories to move vigorously. And you need to move vigorously to warm yourself. Even if you’re nauseated, a tiny nip off of a gel every couple minutes could help. But get your wet clothes off your skin first. So in short, doing all of the above would help to ward off a case of creeping hypothermia. The scenario continues: You don’t do any of these things. You put your head down and continue at a wheels-came-off pace. By the time you get to the Equestrian Aid Station at mile 36, your hands are so cold you have trouble pulling your soft flasks out of your pack. A volunteer pulls them out for you and fills them. You fumble trying to put them back in and drop them twice. You swear. Your teeth are chattering. “What can I get you now?” the volunteer asks. What is something you could ask for that would make you significantly warmer? Take a moment to come up with an answer. Did you answer, “soup?” Nope. Soup’s not the answer. Hot soup will make you happy, but it won’t raise your body temperature. And if it’s broth, it won’t even supply you with the calories you need to fuel the movement that will warm you. Hot chocolate is better because it has calories, but warm liquid in your stomach still won’t rewarm you. Did you ask for a trash bag? Because if you did, you win! Make holes for your head and arms, and then enjoy the heat-trapping and wind-blocking magic of plastic. 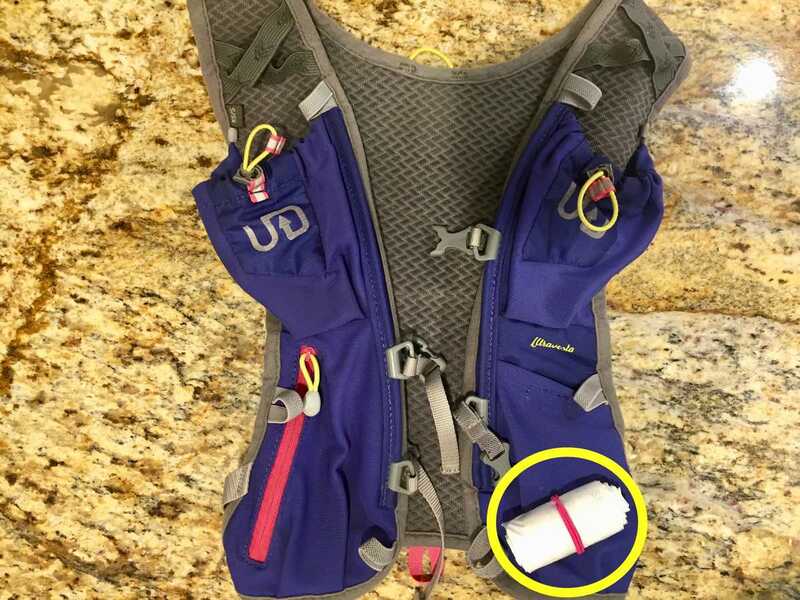 Make yourself an emergency trash bag to carry with you on all your runs. It’s small and doesn’t weigh anything. The emergency blanket that some races require works best if you’re staying still, but it’s hard to secure around you when you’re moving. If you want to use it on the move, wrap it around you and then put another shirt or jacket on top to help hold it in place–better than nothing when you’re cold! 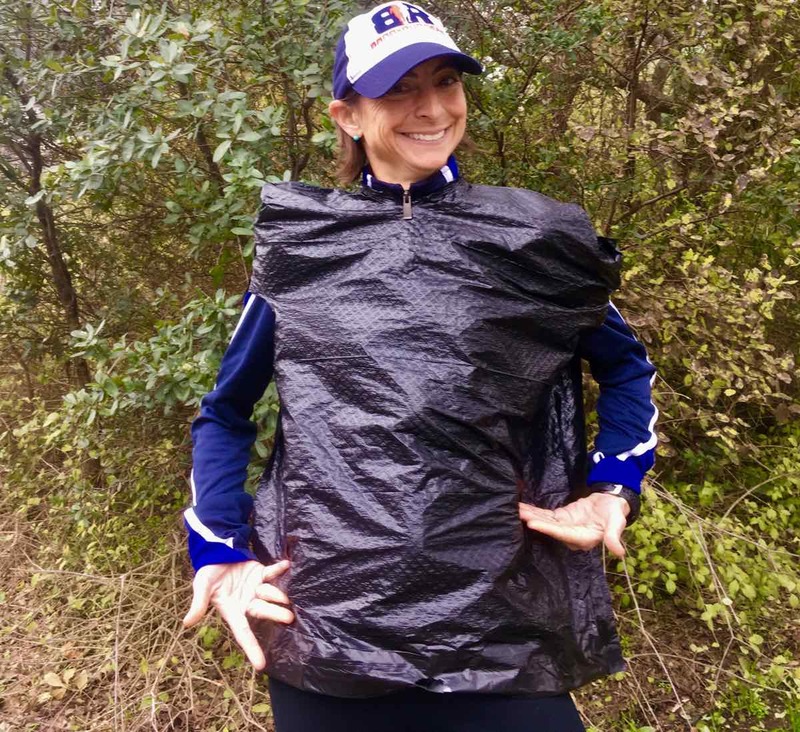 An emergency trash bag might save your race, and it’ll definitely save you from becoming mildly hypothermic if you get caught out unprepared like the runner in this scenario. The scenario ends: You don’t ask for a trash bag. You take a cup of soup and hike away from the aid station. You make it a quarter mile down the trail and stumble. The soup goes flying and you tumble onto the trail. Your hands and knees are scraped up. “This is idiotic! I don’t need this!” you grumble apathetically. You head back to the aid station and get a ride back to the start/finish where volunteers wrap you in blankets and put you under a heat lamp. One veteran volunteer tells you she always carries an emergency layer just in case she has to slow down unexpectedly or stop moving. You mumble your thanks for this advice. It takes few hours for you to feel warm and like yourself again. When you do, you immediately regret your DNF. You’re a volunteer at the Nachos Aid Station. It’s 1 a.m. and you’ve just finished making some quesadillas when a lone runner walks in. The runner stares at you blankly and heads over to one of the chairs. You ladle up a hot chocolate and take it to him, but he’s shivering uncontrollably and can’t hold the cup himself. A. Help him drink the hot chocolate. B. Rub his arms and legs. C. Give him a shot of bourbon. D. Wrap him in a blanket and put a hat on his head. Yes, but not right away. Uncontrollable shivering is moderate hypothermia and you need to something quickly that’ll help him hold onto the heat his shivers are generating. Moderate hypothermia is uncontrollable violent shivering, worsening of the ‘umbles,’ and altered mental status. The body is doing its best to generate heat and keep its temperature up. What you need to do is trap the heat and then help fuel it. This won’t do anything to warm the runner. It might make you warmer though. Nope. Don’t share your bourbon. The sensation of warmth you feel after a shot of alcohol is caused by the dilation of blood vessels close to the surface of the skin. The flushed feeling dissipates quickly as the heat from the warm blood is convected away from your body. Yes! You need to insulate the patient and trap the heat that he’s generating by shivering. Make sure the runner’s clothes are dry, and then wrap a blanket around him. Next, take a plastic tarp and wrap that around the blanket. The plastic will trap even more heat and prevent the wind from convecting heat away. Make sure the runner’s head is covered. Despite what your mom told you, you don’t lose most of your heat through your head compared to the rest of your body. But you will lose heat through your head if it’s uncovered. So put a hat on this runner’s head. You do all these things, and after an hour at the aid station, the runner is still cold, but feeling much better. He’s missed the cutoff though. You tell him about the magic of the trash bag while you wait for a truck to take him to the heat lamps at the start/finish. If you hadn’t taken these steps, and the runner had continued to lose heat, they could have died. Imagine a scenario where the runner was lost overnight in freezing weather. The colder he got, the more incapable he’d be of rewarming himself. His level of consciousness would decrease, his breathing would slow, and his heart would beat more and more slowly as his core temperature dropped. Ultimately, the lack of oxygen to his vital organs would lead to death. It’s 7 a.m., and you and your family are working the Chapas Aid Station at mile 47. You didn’t expect it to feel so cold, and everyone is pretty miserable. You suggest the kids run around to warm up. “Try jumping jacks,” you tell your spouse. They all glare at you. It seems unlikely you’ll be able to convince them to volunteer with you again unless you can think of a fun and quick way to warm everybody up. Think of a fun way to get everybody warmed up quickly. Have you ever had a brush with hypothermia during a trail race or run? What happened and how’d you resolve the issue? What do you carry in your pack to help prevent a dangerous situation in cold or wet weather? This is so great, Liza! Super helpful and an entertaining writing style. I literally just spit out my coffee on the keyboard laughing. In almost all conditions, i throw latex gloves, a shower cap and a bin bag into my running vest. its super light and might make a difference if things go bad. Thank you again for another informative read. 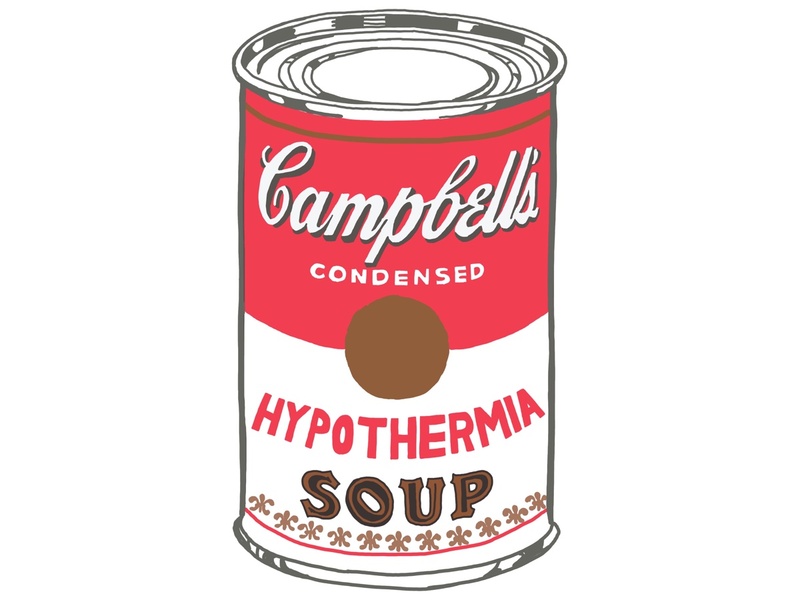 I ask that others do not assume that hypothermia is isolated to the cold weather months. My experience occurred in the middle of a hot Georgia summer. Running under open sun one afternoon, my tech fabric was saturated beyond its capacity to wick and dry my sweat. I was saturated from head to toe. An afternoon storm blew in, and initially the cool rain gave welcome relief. The rate of the precipitation increased and high chilly winds followed. I began shivering uncontrollably and realized that I was quickly getting into trouble. Finally, I made it to my truck, got out of my wet clothing, and redressed with some clothes that were available. Full heat from the blower and seats slowly but eventually warmed me up. In all, the experience was a good lesson. Amen to that point, Jim! Thanks for sharing it. I bet more runners get mildly hypothermic like you described than they do when there’s snow on the ground. Thanks, this was super informative (and amusing!). Clearly I didn’t know as much as a I thought I did about this topic. Trash bag will soon be added to the staples in my running back. I am glad this subject is being addressed. Main point for this comment is a heads up that if you run JFK 50, it is held in November; be prepared for hypothermia to happen – and please plan for it in advance – it is foreseeable. The last several hours of the 2013 race it was dark and a nice 32 degrees – not counting wind chill. After making it to the finish, I had trouble walking and standing. A lot of us slower folks did. Long story short, EMTs and FD were waiting at finish line already (! ), and confirmed some of us had hypothermia and took some of us to the ER for it. They seemed to be checking everyone who finished late for it, as if this was not the first time. Peter, first, congratulations on JFK!! I finished in a freezing cold rain the year I did it. You’re right, it seems like that race often has weather that sneaks up on you — but shouldn’t. This was a super informative article, I had never thought of the trash bag and will be sure to pack one on my future cold runs. I’m curious about one scenario that wasn’t addressed: It’s very cold and you’re a few miles from an aid station (in either direction) when you come upon a runner stopped on the trail with signs of hypothermia. Given limited resources on hand, what do you do? Good question, Steve! If you’re dealing with someone who is conscious and can hike, I’d ask if they had any more layers to put on (cold people often are apathetic about getting gear out of their packs), help them get the layers on — or give them my trash bag to put on. (This translates into quite a bit of trail karma). Then I’d hike with them to the closest aid station and try to keep them hiking fast. If they have food with them encourage them to eat it to help with hiking. It’s unlikely you’d come across a severely hypothermic person (decreased level of consciousness from the cold) at a race. If you did, you’d want to get help and bring it to them. Good job again, simple, to the point and easy to remember! While I usually get all these questions wrong, this lesson I did very well in. YAY! This is why I changed shirts and sports bras 3 times during my 100 in September – I’ve had bad experiences with sweating a ton, cooling down, and then not being able to warm back up. I rarely go on long trail runs where I’m that far away from my car, but I should probably start keeping a trash bag on me just in case. A long shot here, but were you a paramedic instructor for TCC in Va Beach? 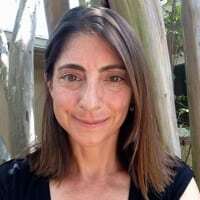 Just want to send a congrats on your article! It’s exciting to see my professor as a prolific writer and runner; still leading from the front. If this isn’t you, well apologies for the weird comment.